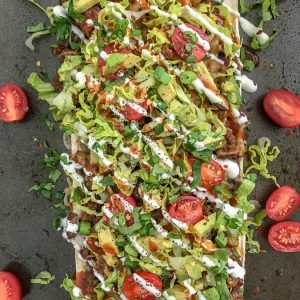 Loaded Skinny Taco Flatbread Pizza – these taco flatbread pizzas are an easy, healthy and lower-carb alternative to that Taco Pizza we all love and adore! Ready in 30 minutes or less! 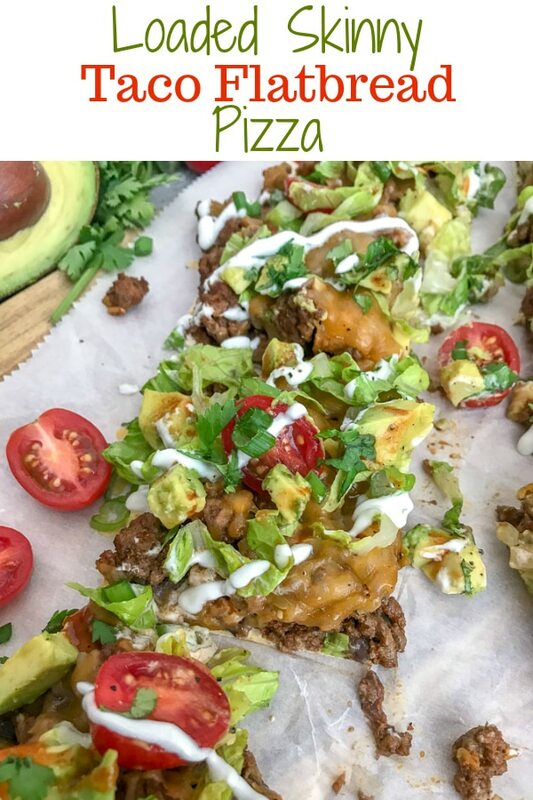 This Loaded Skinny Taco Flatbread Pizza is loaded with refried black beans, cheese, taco meat (with homemade taco seasoning! ), and all the delicious fixings. If you know me, you know that I am a major fan of tacos. 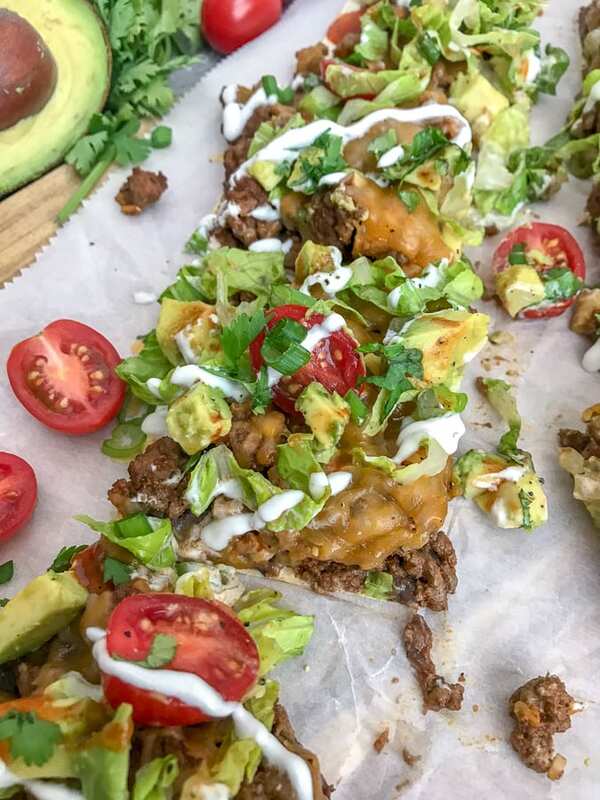 Anything with a hard shell, soft shell, in nacho form, or a healthier, lower-carb version. Such as my Chicken Taco Lettuce Wraps! Did I mention I also love it in pasta form? Yep. Cheesy taco goodness with my Cheesy Skillet Taco Pasta. 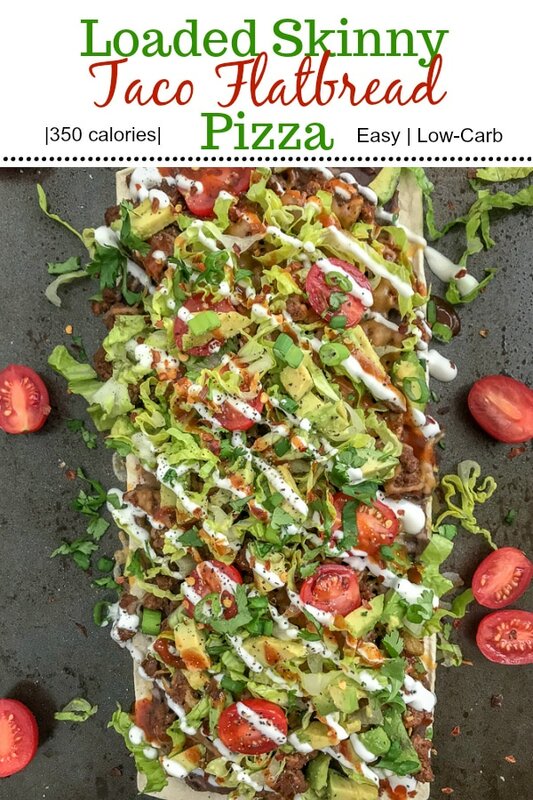 Either way, this Loaded Skinny Taco Flatbread Pizza is going to knock your socks off! 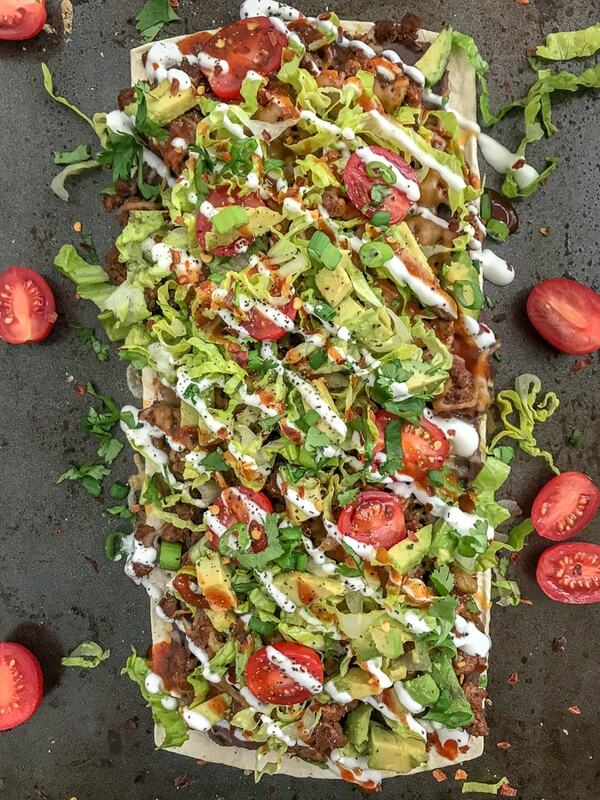 And then topped with all the amazing fixings you can think of: shredded lettuce, cherry tomato halves, diced avocado, plain greek yogurt, green onion, cilantro, red pepper flakes, black pepper, and hot sauce! What’s not to love about a pizza that is made on the healthier side? It’s as though you’re indulging, but without the guilt. Right? 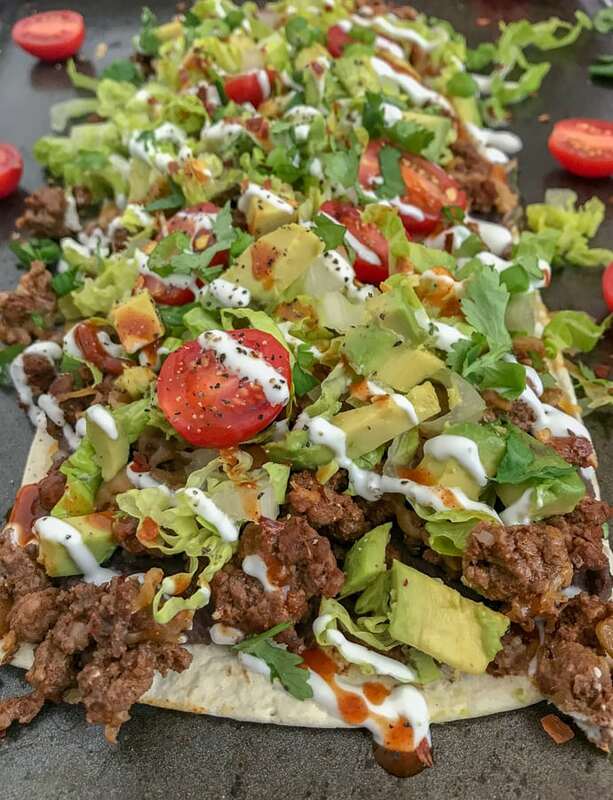 So make these flatbread pizzas and enjoy a few slices of heaven without feeling like you’ve sacrificed your recent workout. If you’re on a time crunch or looking for something simple – another reason to love this recipe. From start to finish, it can be on your table in 30 minutes or less. 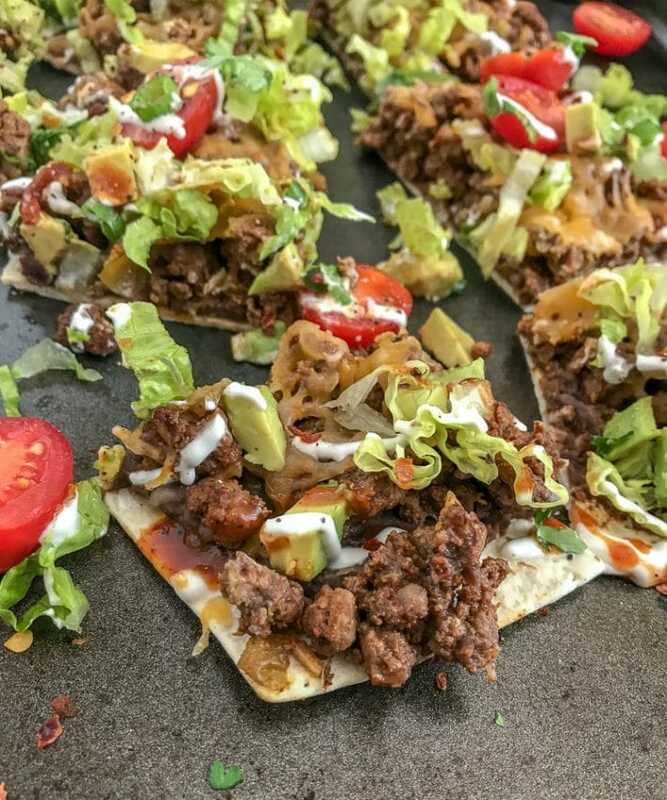 I recently found these flatbreads (Flatout Artisan Thin Pizza Crust – Rustic White) while browsing for new wraps to try for quick meals or lunches for my husband. I’m not sure how new these are or perhaps my chain of stores recently started carrying them. Either way – I am so happy they did. There are several flavors to choose from – which excites this food blogger. So many options = so many new pizza recipes! If you have a hard time finding these wraps, you can find them on Amazon. You can also use your favorite wrap or pre-made thin-crust pizza! Homemade Taco Seasoning – perfect for ground chicken/turkey/beef, or chicken breast. 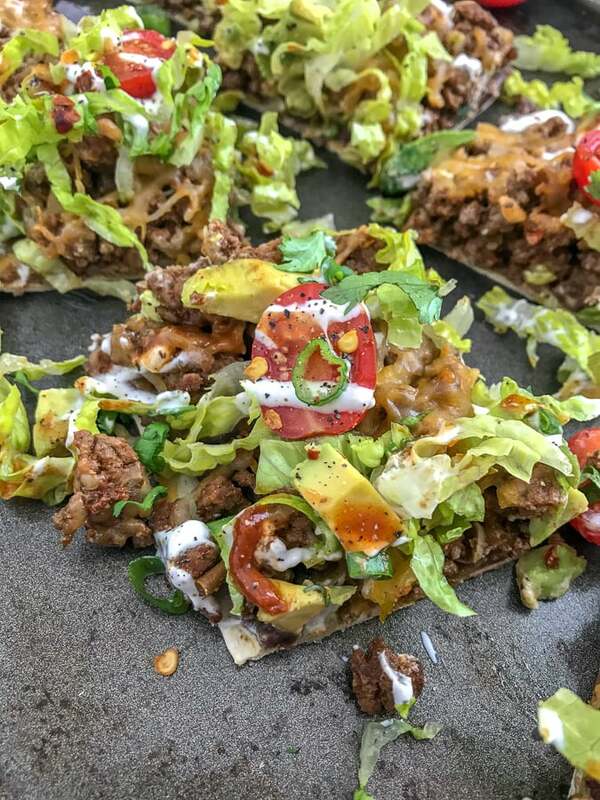 This Loaded Skinny Taco Flatbread Pizza is an easy, low-carb, and healthier version of the takeout taco pizza that we all known and love. 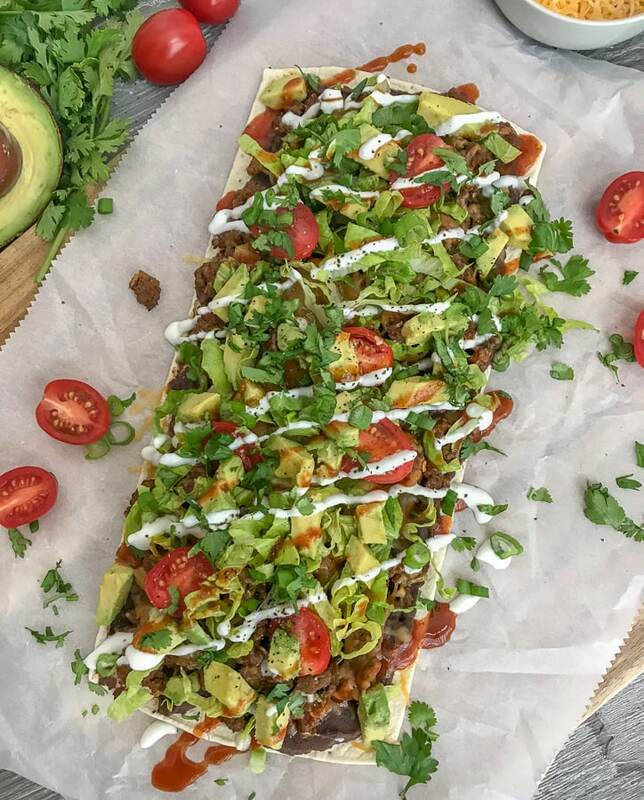 Loaded with refried black beans, lean ground beef, colby jack cheese, and all the best fixings! Preheat oven to 375 degrees F. Place two flatbreads onto a baking sheet and bake for 2 minutes (according to package). Remove and set aside. Place a large nonstick pan over medium heat with olive oil. Once heated, add the lean ground beef - breaking into chunks with a wooden spoon or spatula as its cooking. Add the taco seasoning, stir to combine and allow to cook 4-5 minutes. Add the minced garlic and stir well to combine. Allow to cook 1-2 additional minutes or until the beef is cooked through. While the beef is cooking, prepare the toppings. Once everything is done it's time to layer. Using a spoon, smooth out a layer of the refried black beans over both flatbreads from edge to edge. Top with the cooked ground beef and cheese. Place into the oven to bake for 3-4 additional minutes, or until the cheese has melted. Garnish with prepared toppings listed above or toppings of choice. 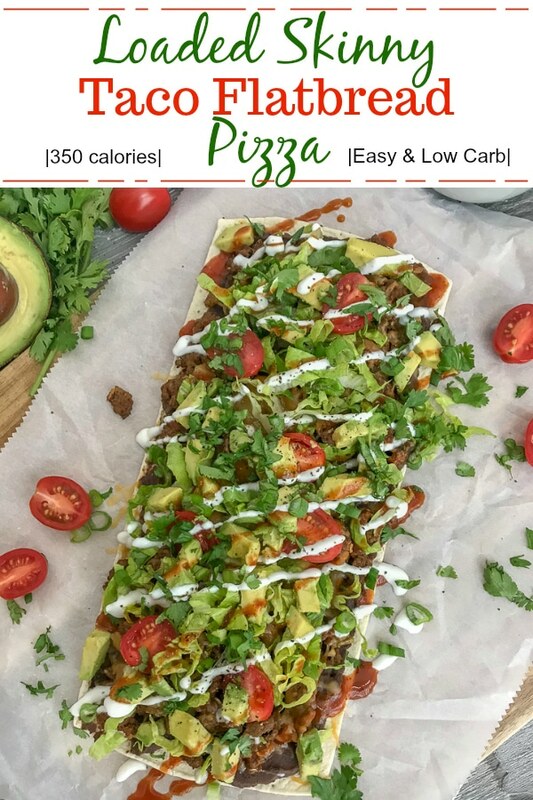 If you cannot find the Flatout brand of Artisan Thin Pizza Crust (used Rustic White), you can order them off of Amazon or use your favorite wrap or thin pizza crust. Toppings listed are optional and not calculated into the nutrition breakdown. This is because the toppings are going to be different per person. So have a ball topping yours! *You can find canned mild green chiles in the same aisle you find the rest of the taco fixings. It will give the taco meat a little heat, but nothing that will leave your mouth on fire. You can omit or go for the hotter green chiles. Your preference! You can use my Homemade Taco Seasoning recipe, store bought, or your own!